Small things make Square happy…. Photo courtesy of Dianna Sinkuc. Car air freshener found in Japan. The Pod People are trying different shapes. Don’t go to sleep! They may take our lives, but they’ll never take our f-SQUARE! Oh no. It’s the body snatchers again…. And sit there having good time. 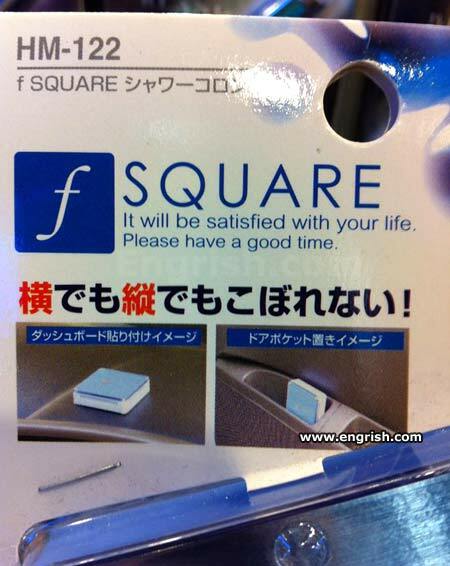 f-square will watch silently from a corner of your car while you are having a good time at the drive-in. And it will be satisfied. The enrichment center reminds you that your companion square cannot speak. Please ƒollow me on ƒacebook! Can I sacrifice another life to satisfy the Square instead of my own life? – What’s wrong, darling – is everything all right? Some bad news about your missing brother? Oh, no… it’s the square, isn’t it? Happy Fun Ball’s mortal enemy. It will be satisfied with your life or it gets the hose again. Whew! If a chunk of paper can be satisfied with my life, there’s no need for me to change! Take that, nagging spouse! If your life is not spared, it will be squared. okay, sorry, no, I’m not doing that. I’m imagining f-Square draining my soul like Shang Tsung in Mortal Kombat. There are two options: It will be satisfied or it will become a triangle. @algernon. I could have one hell of a lot of fun trying though. In Japan, square smells YOU! The product that owns you! I’m sick of these squares thinking that they own my life, man! A cube is a square with depth man. CAUTION: Does not enable user to fly. I’LL GET SQUARE WITH YOU! Tsquares are so passe, use an Fsquare for more exciting building. In Communist Russia all buildings are built using Fsquares. f-SQUARE could give you some new angles on life, right? And I thought a lover’s triangle was something. Amid the rampant media speculation over the Facebook Phone, the launch of the Foursquare phone was largely overlooked. Who the hell be square and why he no get his own life? No good if square take over life, it will not be a happy time. Such an easy square to please. Welcome to my life, now drop your pants.